Manually assigning IP addresses without a DHCP server can create havoc on your client network. Your DHCP configuration and administrative tasks can be handled easily with our software. Antamedia Hotspot comes with built-in free DHCP server, which can be used to assign dynamic IP addresses to devices in client network. Before you can start using it, proper IP settings have to be configured. 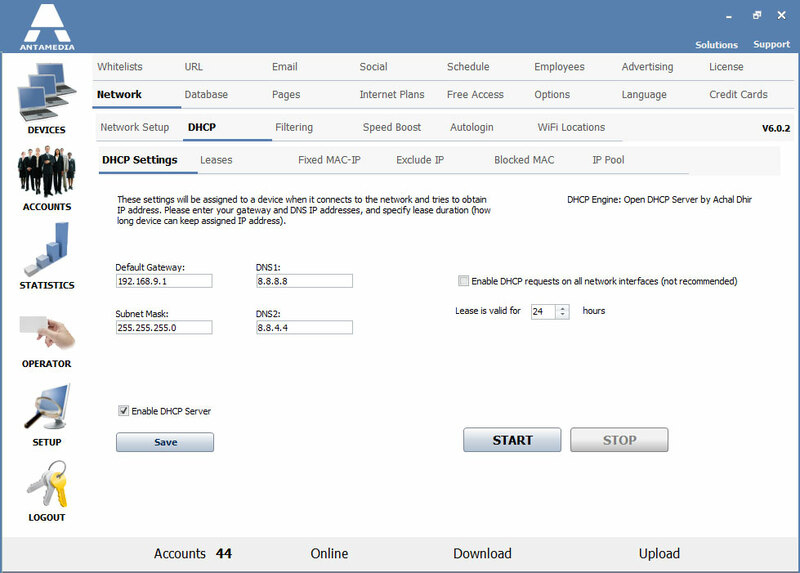 Please go to Hotspot Setup – Network – DHCP page and click DHCP Settings tab. Default Gateway – The Default Gateway address client devices will use to access networks outside their own subnet. In most cases, you need to enter IP address of NIC2(LAN) adapter in this field. Subnet Mask – Value in this field has to match value set in IP properties of NIC2(LAN) adapter. DNS1, DNS2 – Client devices will use DNS servers to resolve the names of websites to IP addresses. It is recommended to use DNS addresses of your ISP or public DNS servers such as Google’s (8.8.8.8, 8.8.4.4). Lease is valid for___hours – This option determines how long client devices can keep assigned IP address. It is recommended to set value of 8 hours for wireless networks. A pool of available addresses is automatically created based on IP settings of NIC2(LAN) adapter. If you need to add a new pool or modify existing, that can be done on the page under IP Pool tab. After you configure these settings, check Enable DHCP server and click Save button. Restart Hotspot and DHCP will start automatically with it.